Radiation dispersion forecast is available from the Switzerland Meteocentrale website. Contrarily to previous announcement on SurvivalJapan, Meteocentrale uses MEXT data so it is not entirely reliable (Cf. Problematic Japanese Environment Radiation Readings on SurvivalJapan). However, MEXT data only for Fukushima ground zero should be trustworthy. Here is a screenshot of their radiation dispersion movie for Japan today. 2011 Sept. 9 – Tokyo and Hokkaido are out of the fall-out today as the anticyclone which has been pushing it back is now gone. The livability of Tokyo was put in question in several posts on SurvivalJapan . In a rare article from AFP, former Prime Minister of Japan in charge during the Fukushima melt-down, M. Kan, falls short of answering clearly the question – yet between the lines are expressed all that we needed to be confirmed, in a Japanese way. The only doubt now remains about Hokkaido, for which there is a strong presumption of contamination (Cf. Dangerous Domestic Butter Production Promoted by Mainichi Daily News on SurvivalJapan). On a side note, the article makes it quite clear that the Japanese government is aware that the no man’s land really extends to “half the country”. Cf. Switzerland Meteocentrale Provides Radiation Dispersion Forecast and Problematic Japanese Environment Radiation Readings on SurvivalJapan. Key quotes: “Japan wouldn’t stand as a country if the uninhabitable zone (around the crippled Fukushima plant) had to spread out to 100 or 200 kilometers. Evacuating 100,000 or 200,000 people is a really grave situation, but if 30 million people were to be subjected, evacuating them all would be impossible. When you think of the chances of an accident that could make half the country uninhabitable, you cannot possibly take that risk, even if it was once in a century”. According to the AFP article, in a separate interview, Kan told the Asahi Shimbun daily that the government had run a simulation of a widened evacuation zone up to 300 kilometers around the Fukushima plant, which would affect Japan’s capital and the entire Kanto region. Former Prime Minister Naoto Kan feared Tokyo would be rendered uninhabitable by the Fukushima nuclear crisis, he said in an interview published Tuesday in which he recalled the “spine-chilling” thought. He added it would have been “impossible” to evacuate all of the 30 million people in the event of a mass exclusion zone encompassing Tokyo and the Kanto region, and said that this risk made nuclear power a too dangerous option. “Deserted scenes of Tokyo without a single man around came across my mind,” he told the Tokyo Shimbun newspaper, describing his thoughts as the nuclear emergency deepened in the days after the March 11 quake and tsunami. “It really was a spine-chilling thought,” he said. Kan officially stepped down a week ago amid criticism over his handling of the aftermath of the March 11 triple disaster—a 9.0 magnitude earthquake, a tsunami and the world’s worst nuclear accident since Chernobyl 25 years ago. The towering wall of water battered cooling systems at the Fukushima Daiichi nuclear plant, 220 kilometers northeast of Tokyo, triggering reactor meltdowns and spewing radiation into the environment. The disaster forced the evacuation of tens of thousands of people around a 20-kilometer radius and in some pockets beyond the plant, with many activists and scientists calling for a wider exclusion zone. Japan is struggling to bring the crippled reactors to a state of cold shutdown by a January target. After the calamity, Kan declared a shift in the country’s energy policy toward renewables. His successor Yoshihiko Noda has suggested Japan will eventually phase out atomic power generation in the resource-poor nation and Asia’s second-largest economy. “I thought nuclear plants were safe as they were supported by Japan’s technology. But I changed my mind after the experience of the March 11 disaster,” he said. “Japan wouldn’t stand as a country if the uninhabitable zone (around the crippled Fukushima plant) had to spread out to 100 or 200 kilometers. Evacuating 100,000 or 200,000 people is a really grave situation, but if 30 million people were to be subjected, evacuating them all would be impossible. Kan, a one-time environmental activist, pledged to boost alternative energy sources to 20% of the nation’s energy mix by the 2020s, pushing through a law on promoting renewable energy in parliament immediately before resigning. Alternative energy sources currently make up about nine percent, most of it hydroelectric power. Under Japan’s previous energy plan atomic power had been set to meet over half of demand by 2030, up from about one third before the March 11 quake-tsunami disaster. In a separate interview, Kan told the Asahi Shimbun daily that the government had run a simulation of a widened evacuation zone up to 300 kilometers around the Fukushima plant, which would affect Japan’s capital and the entire Kanto region. “When you think of the chances of an accident that could make half the country uninhabitable, you cannot possibly take that risk, even if it was once in a century,” he said. After promoting the government decision to spread the radioactive waste to whole Japan (Cf. Hosono’s Spread of Radioactivity Decision Promoted by Mainichi Daily News on SurvivalJapan), the Mainichi Daily News discreetly supports domestic butter production policy pushed by the Lifestyle News Department, under the attractive, helpful and seemingly harmless title of : “News Navigator: Is there going to be a shortage of butter?”. While Fukushima plumes regularly visit Hokkaido, although MEXT environment readings for this area remain radio-negative, we should be concerned (Cf. The Mainichi answers common questions readers may have about rising butter prices. Question: There have been reports that there’s going to be a butter shortage. Is this true? Answer: The Ministry of Agriculture, Forestry and Fisheries (MAFF) announced in early August that it would be receiving an emergency import of 2,000 tons of commercial-use frozen butter. This seems to have contributed to the impression that we are facing a butter shortage. Q: Why are we importing butter? A: The simple explanation is that the supply of domestic milk used to make butter has dropped. Dairy cows must give birth to calves to produce milk, and are generally impregnated through artificial insemination. The extreme heat in the summer of 2010 resulted in the poor health among cattle, pushing back the insemination period. This delayed milk production, which would normally have begun in spring, when the cows had given birth 10 months after insemination. Add to that the extreme heat of this summer, and what we have is a decline in the volume of milk produced. There are around 1.5 million dairy cows in Japan, of which close to half are in Hokkaido. The majority of domestically-produced butter is made in Hokkaido as well, which has been affected by the summer heat. Q: Can’t the butter from other prefectures make up for lagging production in Hokkaido? A: The nuclear disaster at the Fukushima No. 1 Nuclear Power Plant forced dairy farmers primarily in Fukushima Prefecture to dispose of about four tons of raw milk this spring. In addition, the hot summer contributed to a dip in milk production across the main island of Honshu. Because Hokkaido milk was making up for the four tons of raw milk that was dumped, now there’s a shortage of milk there. About 8 million tons of raw milk is produced in Japan, and Hokkaido — which produces half of the national total — is single-handedly supplying the milk needed for products such as cheese, butter and cream. Q: So Hokkaido is fulfilling a very important role. Is it common for Japan to import butter? A: There was a butter shortage three years ago due to a drop in milk production, and butter was imported prior to the Christmas baking season when demand for butter rises. According to an MAFF official, pre-emptive measures for butter were taken this year to prevent a repeat of what happened then. Q: Is it true that butter prices are going to rise? A: Major dairy manufacturers announced that suggested retail price for home-use butter will go up by 5 yen beginning with butter that is shipped on Oct. 1. This is due primarily to the price of milk rising by 1 yen, to approximately 68 yen per kilogram. With lower milk production leading to decreased earnings and the continued high cost of feed, dairy farmers are struggling to make ends meet. 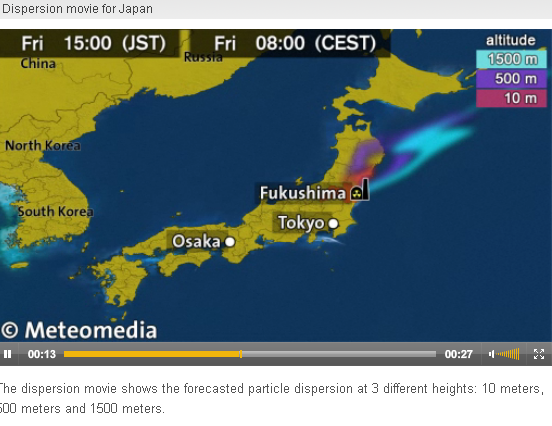 Animated forecast for radiation dispersion from Fukushima is available from the Meteocentrale website in Switzerland, at altitudes of 10, 500 and 1500 m. In its “Dispersion movie for Japan”, the forecast show that plumes regularly reach far out at any altitude, i.e. all Japan and further out. When I checked it in the last couple of days, wind blew primarily eastward with secundary streams turning back to Hokkaido and Tokyo / Chiba. This is consistent with reports of radioactivity in Tokyo, Chiba, Saitama, etc. It reinforces my belief in the fact that readings reported by MEXT are not faithful to reality (Cf. Problematic Japanese Environment Radiation Readings on SurvivalJapan). Indeed, according to MEXT, Hokkaido for instance is globally radio-negative whereas the Meteocentrale animations clearly show that this area is often under the Fukushima plumes. Among other goods, Hokkaido provides most dairy products such as butter, milk and cheese in Japan and it is a major industrial fishing and wildlife center (Cf. Dangerous Domestic Butter Production Promoted by Mainichi Daily News on SurvivalJapan). Eastern Japan food and water should be completely avoided and Hokkaido is now highly suspicious. One could argue that Meteocentrale provides a forecast based on a model which may or may not exactly reflect what is really happening. Yet a look to the “Streamlines movie for Japan” clearly show winds heading back to Japan over Hokkaido and Greater Tokyo around a high pressure zone. We can infer that when meteorological maps show this particular high pressure zone, we will not need any animation to know that radiation from Fukushima is bound to fall on Hokkaido and Greater Tokyo areas. It is highly unlikely that these maps can be censored by the government and they are always available from many foreign sources on the Internet. Furthermore, we can question the harmlessness of staying in any place in Japan – but for Okinawa – and in South Korea given the 800 – 1000 km extent of plumes. In the case of Chernobyl, they extended as far as Spain according an animation shown in the documentary movie “Into Eternity“. However, the Meteocentrale animation show that they travel mostly over obstacle-free Pacific Ocean, as was the case when the hydrogen explosion occurred. We should monitor if this is the normal stream (from west to east); if some stream are ever forecast to reach western Japan and Kyushu; what is the likely dose value at the end of a plume (likely to be “quite low”).